What can I say? 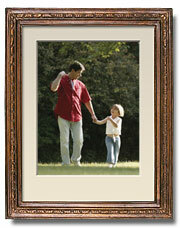 All you wand makers out there are lifting the idea to newer and newer levels of creativity. It’s really amazing and brilliant to see all the wands you are making. I’m having trouble keeping up.
. . . As more and more pictures of wands come in, we’ll try and put them up on line so that everyone can be inspired. 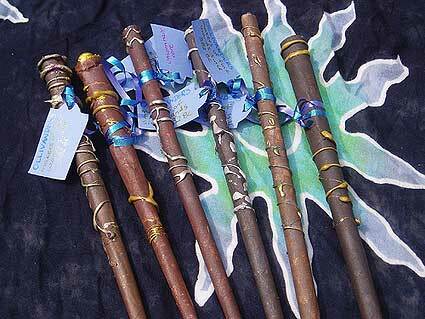 Here are some of the best ones and it’s amazing how many different styles of fabulous wands have evolved from the same dadcando project. Some of these are just mouthwateringly beautiful (and that is not an overstatement, although I’m sure you will be able to judge for yourself), some look like they were actually the ones used in the film! We think that all these wands are absolutely fantastic and can't wait to see more from all you Harry Potter fans out there.
. . . Easy to follow instructions oh how you can make your own Harry Potter style wand just like these can be found here . 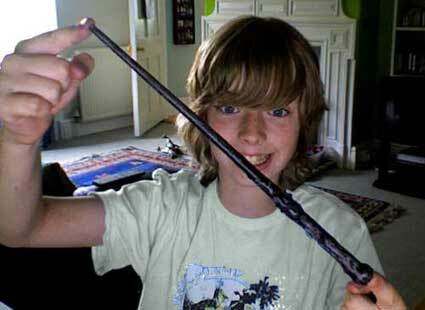 Well your dedication to the art of wand making has certainly paid off… big time. I’m glad you’re pleased with the results they are fantastic. And this one the Pixie Wand. 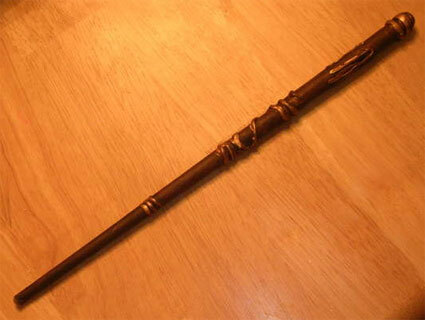 I made my wand, showed it to some people, and now they all want them. I finally found something to amuse myself with besides designing for Sims 2. :) Have a great day. They look so cool and really different. Once again I am surprised by the diversity that one design idea can create. 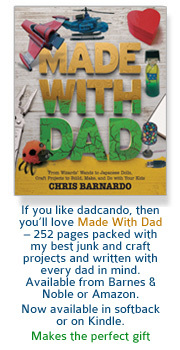 And thanks for the link, you really have made loads of great looking wands. I wanted to let you know, I made your quills and wands for my son's 8th birthday party. Everyone loved them!! Thank you for the easy to do Harry Potter crafts. Being a single mom on a tight budget, these helped make my party a huge success! 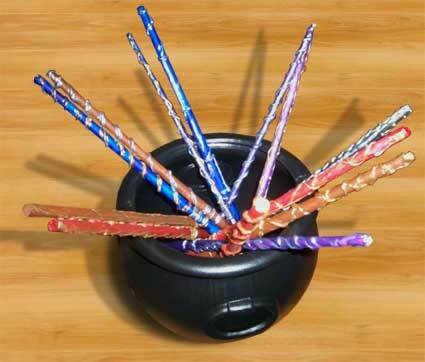 Here is a picture of the wands we made in a cauldron. They look great, I bet the kids had a whale of a time. It really *IS* amazing, the global appeal of this project- you should be quite proud! It's such a simple design that anyone can do, but it's ingenious in its simplicity.
. . . I just recently made another wand for my sister-in-law for a convention this weekend. She's going as 'Tonks.' 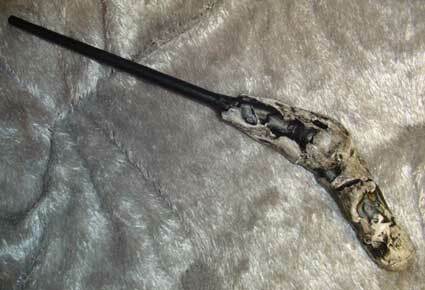 Since Tonks is an Auror and a bit on the clumsy side, we decided her wand should look a little beat up. I bent the tip slightly and took a few notches out of the 'wood' (I painted in some faux 'wood grain.') I'm quite happy with how it turned out!
. . . I'm off to take a look at your snitch! Thanks again Chris! What can I say? Your wands just get more and more exciting. My son Julian and I particularly like the bronze wand. Whew!!! I know I'll get sleep one of these days! 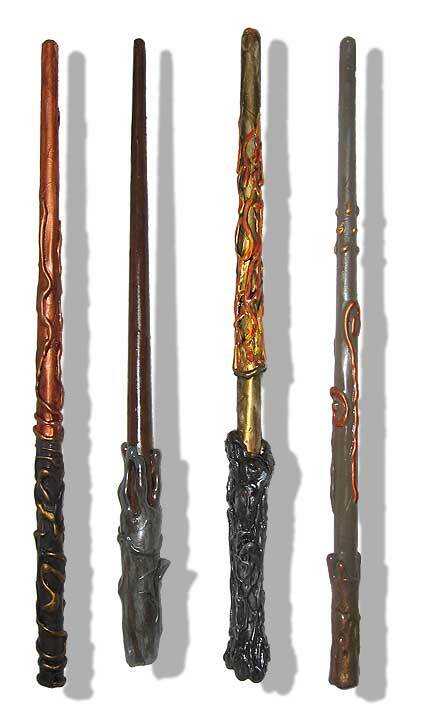 Well there’s no time for sleep, as the wand factory cranks up a gear (surely you must have a House Elf to do some of the work for you), but in any case, as a result we do have the pleasure of seeing four more of the beautiful wands from the house of Bryna. These look terrific and as we can see from the picture, Lilah and Julian must be casting spells left, right and centre! This has been a wonderful find! Now I don't have to spend $40 on wands for my HP obsessed kids. Thanks for sharing!! 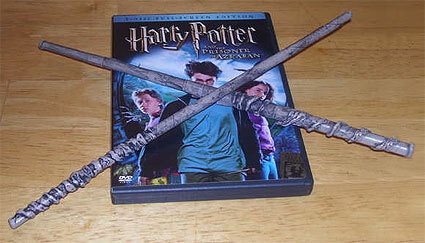 Amazing, those wands really look the part, thanks to you to for sharing. The first one (gray)is Dumbledore's wand (the Elder Wand). I made the orbs by moulding glue gun along the wand.
. . . The other one (brown)is Harry Potter's wand. I made the handle thicker by rolling a piece of paper before covering it with white glue w/ water and toilet paper, which made them look irregular like wood and also made them hard. 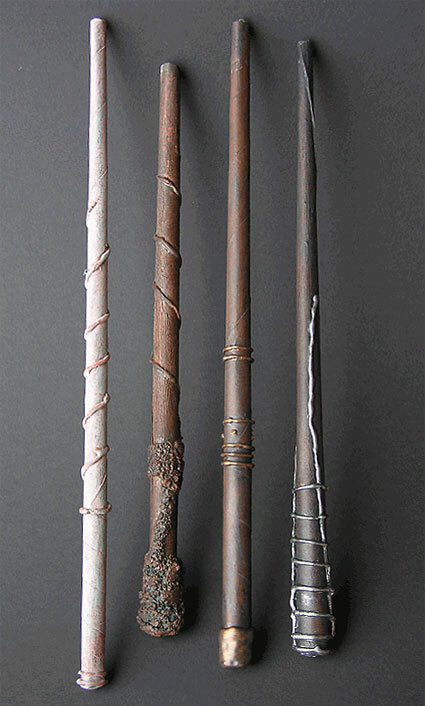 So, here are my wands, hope you enjoy them!
. . . By the way, your website is really cool. Well I think you’re cool too and thanks for sending us those pictures, your wands look very nice indeed. We think this is a fabulous wand. 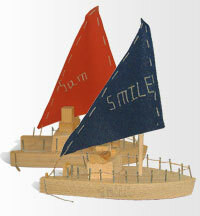 Making and craft is all about improvisation and making things with the stuff you have to hand. Inventing is the best part of making things. 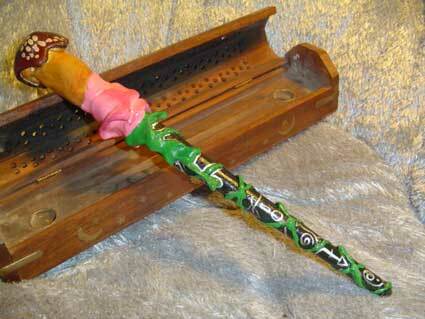 This is a very good looking wand, and using string was a master stroke of genius. Keep up the good work and send us pictures of anything else you make. Well as it turns out you did have PVA, only in the US it is normally called Elmer’s White glue, or school glue. We love the use of the gold markers, they make a very metallic looking wand. This is a fantastic idea you thought up . Me and my mate were making them all day today. This picture is only of my Harry Potter's wand but I have Hermione's too. 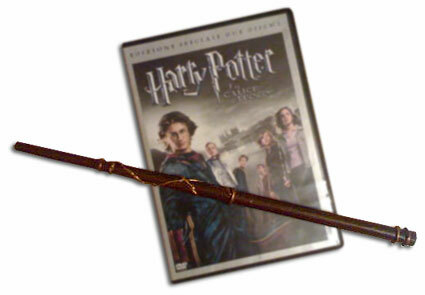 This is a very good looking wand, just like Harry Potter’s one, glad you enjoyed the project. This is the coolest, most awesome idea I've ever seen. I was introduced to this by a friend earlier today and haven't been able to stop making them. 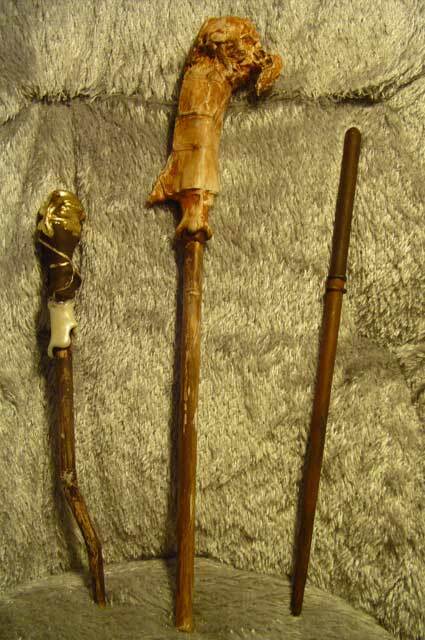 I've already made four wands, and my brother has made two. I'm very obsessed with Harry Potter and this just made my life. Thanks so much for this idea! 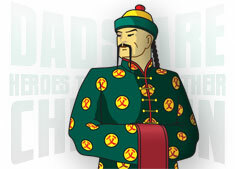 Glad to be of service and I must say that your wands look fantastic, and so do your brother’s (see below). My wands! These were everyone’s favourite! People kept asking to buy them, so we started giving them away for a donation to charity. I ended up making a few more batches, but only took pictures of the first batch. 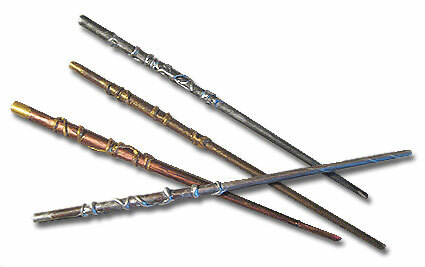 The wands are probably the most successful craft I've ever done, in terms of people liking and commenting on them. 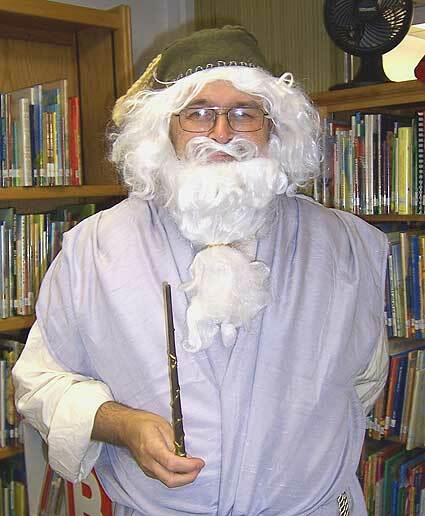 I’m afraid we didn’t think to do any close-ups of the wands, but attached are photos of our kids decorating their wands and one of me doing a really bad Dumbledore imitation. My son said I looked more like Father Christmas in a toga. That’s not right, we think you look fantastic, and the wand looks great. We had great fun making them - thank you for sharing your secrets! 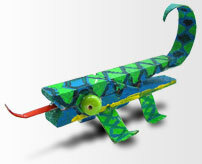 We just bought a detail glue gun, so am planning to make some other ones :-). Just finished making mine! It looks great. Thanks so much for the great instructions. Here's a picture of mine. I love it! Well we love it too. 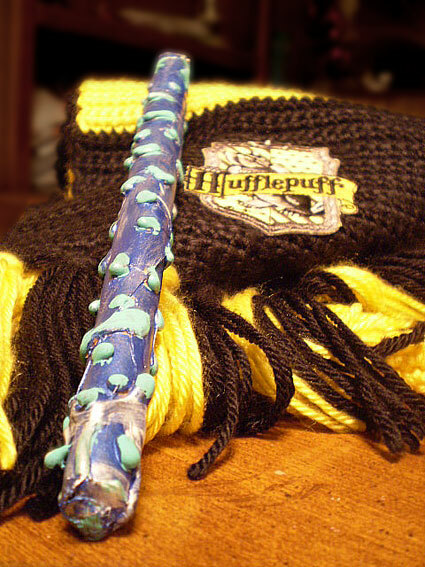 When I made one I glued one end of the wand, then I filled it up with glue from a hot glue gun. When I finished I gave it to my 3 year old cousin and she couldn’t bend it. It made it really sturdy. I didn't put gold on my glue so it looks like real wood. Here is a picture of the ones I made. Good idea, you could also fill it with 3 minute epoxy resin, that would make it strong. 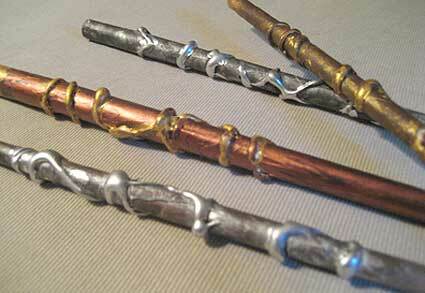 Hello, I just wanted to thank you so much for your beautiful tutorial on making Harry Potter wands! I've made some for myself and my friends for the release of the Harry Potter book this week, I've never had more fun doing a craft! The first is a standard wooden wand colour, the next 3 are done in house colours for Ravenclaw, Gryffindor and Slytherin, and the last is done in bright colours for a little girl who I know is going to love it! Thanks so much! This is fantastic! The thick handle was created by glooping on lots of hot glue and pressing handfuls of dirt into it. Repeat as necessary to achieve desired thickness. You definitely want to use spray paint on that before you hand paint to avoid knocking the dirt off. I made one really fast, just to try it before my friends and I make them. I couldn't find any Elmer’s glue so I used a glue stick which worked really well. I didn't have to wait before I cut the tips. I then used sticky tack to fill in the ends because I couldn't find a hot glue gun either. I spray painted with a pretty purple and went over that with black. I will be sure to send you pictures of the wands my friends and I make later. I made a fantastic wand! 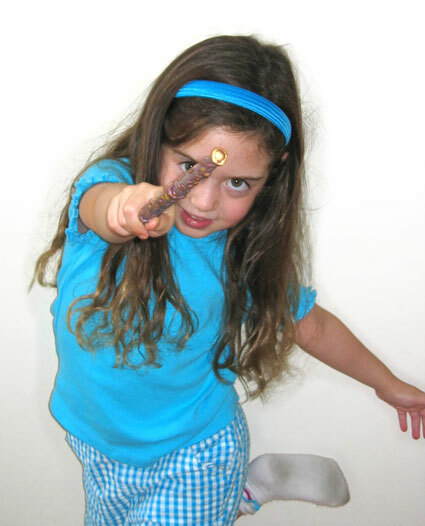 Thanks for the project…Here’s the photo of my wand!!! Here's the pictures of the wands I made using your pattern! 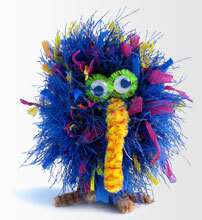 Thanks again for sharing the craft on your website - it was so fun to make! 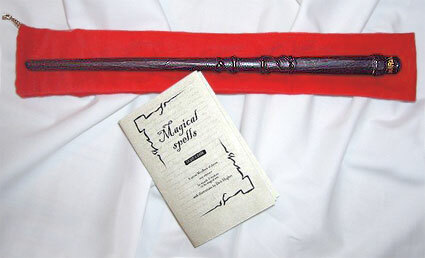 So, I rather gleefully jumped on this after a friend of mine sent me this link and made a wand for myself - I've found few real wands that I actually like - and now my little sister would like one, which I'll have to make later, since there's not enough time now, before the movie opening and all. So, cheers! Me and a friend are going as Death Eaters to the movie premiere and book launch - We had a costume making party last weekend and got together a few people - we've made wands using your method! I'll send you a pic soon. :) Thanks for such a great project! I couldn't help myself! I am doing "Hogwarts Summer Correspondence Course" (a yahoo group) with my 3 oldest kids and so these couldn't have come at a better time! LOL!! I just HAD to try them out! Hello! First of all, I have to say, thank you SO MUCH For such a great idea, with these!! I also wanted to add that my sister and I deviated a little bit from your original plans for them - We rolled ours out of card stock, instead of just regular paper. They came out nice and sturdy, though I don't question the sturdiness of any wands made with regular paper, either!
. . . 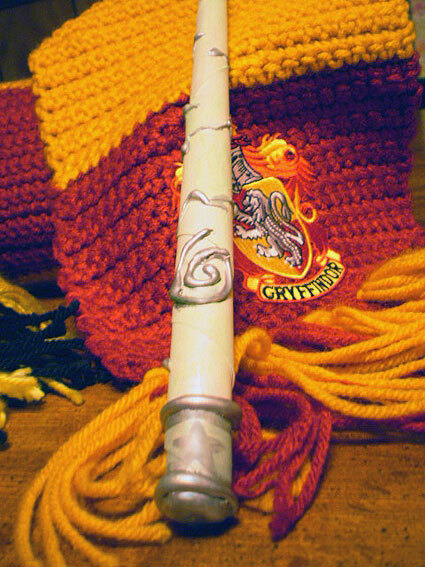 The photos - My wand, the one with the Gryffindor scarf, is 12.5" Birch wood, Dragon scale core! My sister's is 12" bamboo with mermaid hair core.
. . . See, your wand making idea REALLY captured our imaginations! As soon as they were finished, we were practicing our "swish-and-FLICK!" moves and casting spells and charms left and right. We think that all these wands are absolutely fantastic and can't wait to see more from all you Harry Potter fans out there. Easy to follow instructions oh how you can make your own Harry Potter style wand just like these can be found here .